It’s spring and that means it’s time for Basel, the definitive international watch show. Around this time every year all of your favorite brands – and brands you’ve never heard of – launch unique timepieces that cost more than a few dozen Honda Accords and look like something made by Doctor Manhattan during one of his less melancholy moments. Today’s wild timepiece comes to use from Bell & Ross, makers of big square watches that look like aircraft dials. 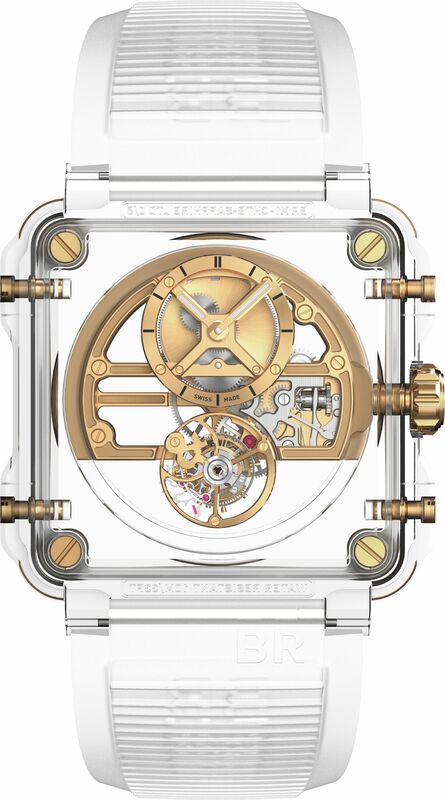 This new piece, called the BR-X1-Skeleton-Tourbillon-Sapphire, maintains the traditional B&R shape but is almost completely clear with a case made of sapphire and held together by pins and screws. The movement, which comes in three colors, is a complete hand-wound tourbillon system and is beautifully visible from all angles. A tourbillon, for the uninitiated, is a system for rotating the watch’s balance wheel 360 degrees. This system, originally created by Breguet, ensured that a watch didn’t slow down when subjected to odd gravitational forces. Now, however, it’s a wildly expensive conversation starter. This is a beautiful update to B&R’s original see-through watch and, while the vast majority of us will never own something like this, it’s nice to know that someone still cares about horological complexity paired with wild design. How much does it cost to own the watch equivalent of Wonder Woman’s Invisible Jet? About $500,000. The piece, for those interested in picking one up, will be available online.